We tend to take the tunnel for the ILC for granted. The current focus is on getting the national government to make a move on the ILC, and getting the people of Japan to support the project. The actual physical tunnel in the Kitakami mountains is just the details. But when you think about it, this huge tunnel would actually be quite a feat! For reference, the Seikan Tunnel underneath the sea between Aomori and Hokkaido is almost 54 km long, and the longest tunnel in Japan. The ILC may be built as long as 50 km, so technical experience in digging tunnels is going to be crucial. 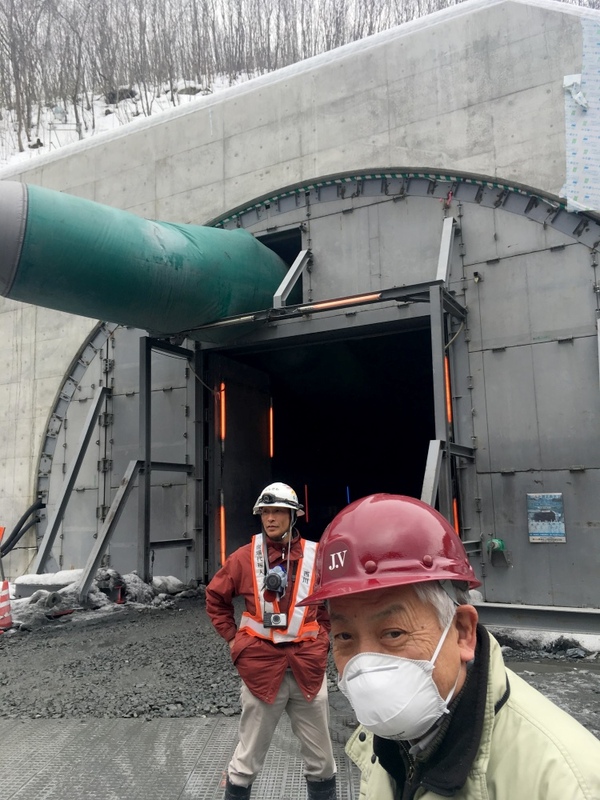 Well, you’re in luck – We actually got to see a tunnel in progress right now in Iwate that gives a good picture of how the gargantuan ILC tunnel will be created. As part of the reconstruction from the 2011 earthquake and tsunami, the national government has been building “reconstruction roads,” which are highways that connect the inland to the coastal regions. In Iwate, there is an East-West Highway being built between Morioka City inland, and coastal Miyako City. However, there’s a big issue with building high-speed throughways in Iwate: you need to burrow through the countless hills and mountains in our central region. For this particular highway, Kajima and Tokyu Joint Venture received a contract from the national government to build a 5km long tunnel called the Shin-Kuzakai tunnel, which will be the longest tunnel in Iwate. One challenge following the 3.11 earthquake and tsunami was in traveling quickly to the coastal regions. 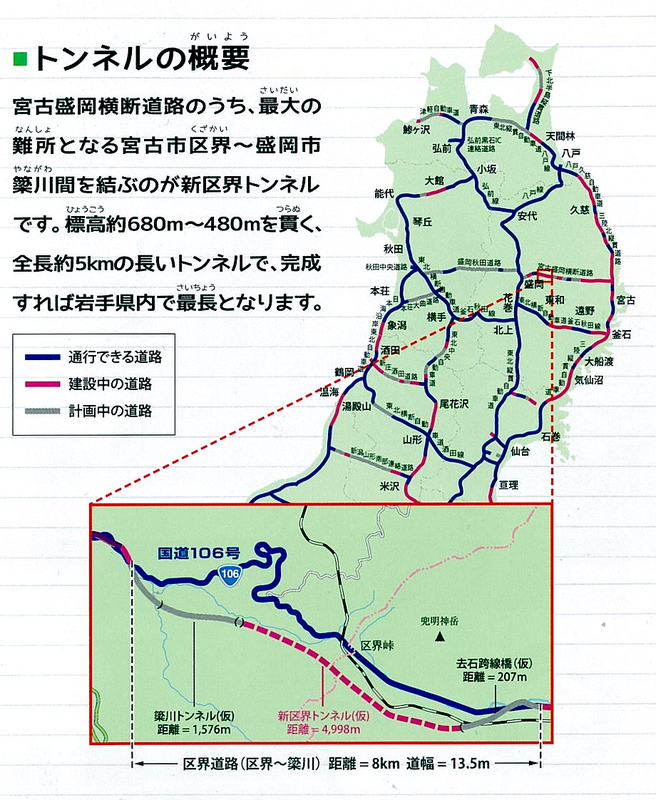 When the East-West Highway between Morioka and Miyako is finished, not only will it be used as a route for quickly supplying disaster aid and reconstruction equipment, it will also improve emergency medical care, promote tourism, distribution, and other industries, and increase exchange between regions through more convenient travel. Map of Tohoku and the section of the Shin-Kuzakai Tunnel in Iwate. 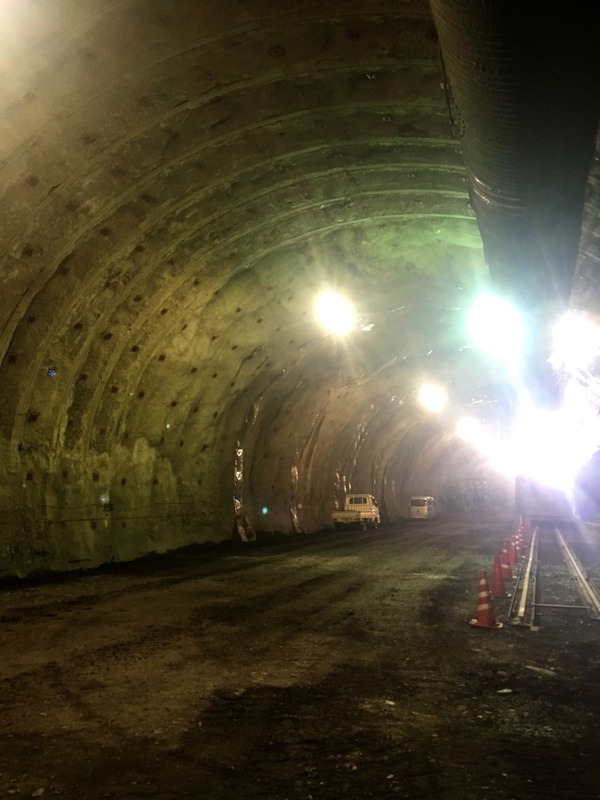 Kajima and Tokyu Joint Venture, the company responsible for building the tunnel, has been using a drill jumbo machine from Sweden that helps them dig the tunnel. 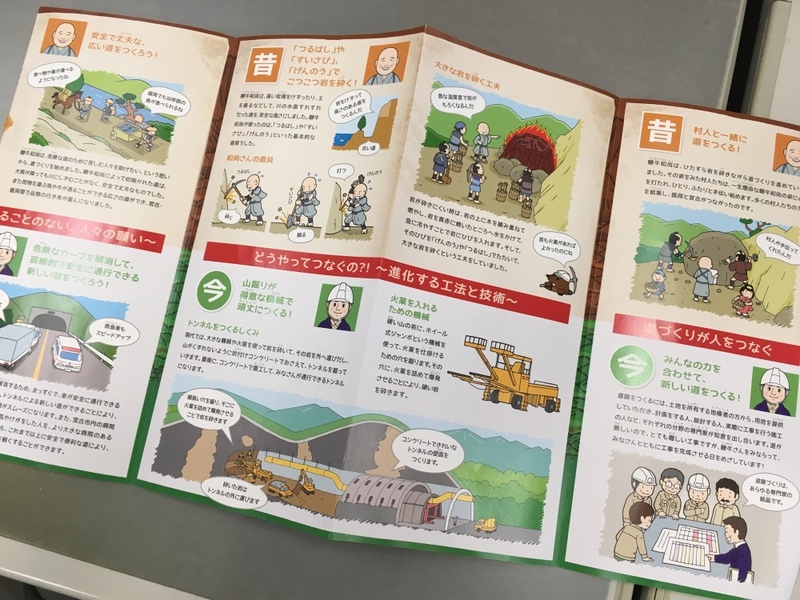 They’re using the New Austrian Tunneling Method (NATM), which makes the most of the strength of the rock mass surrounding the tunnel (the most common method used in Japan since its introduction forty years ago). 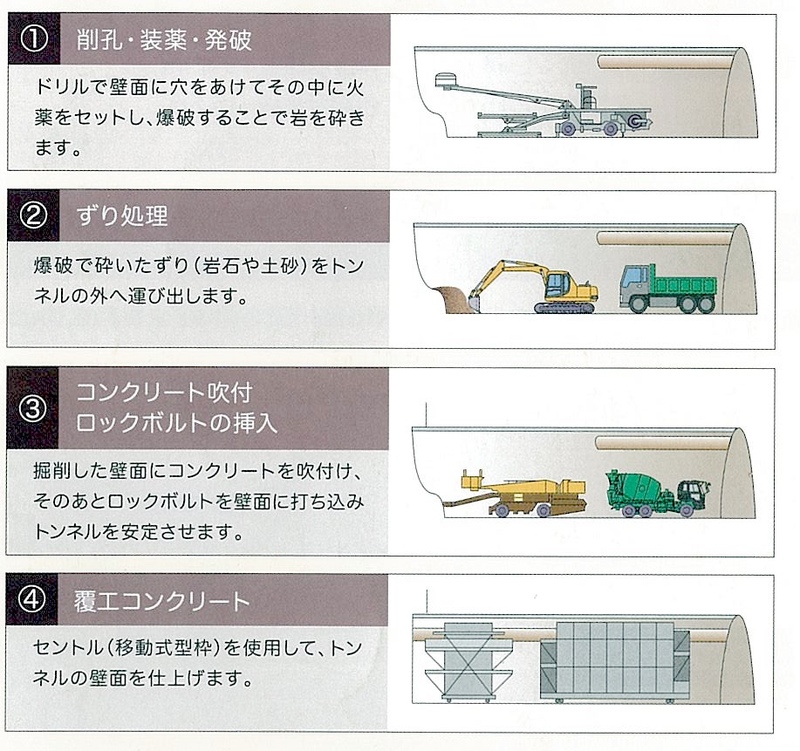 Shotcrete and rock bolts (and steel support, if necessary) are used immediately after the excavation to prevent the rock mass from loosening, whereas wooden logging and steel support were used in the Japanese conventional tunnel method from 30-40 years ago. Compared to the TBM (Tunnel Boring Machine) method, the NATM has a number of advantages, such as creating complicated tunnel cross sections more easily. This fully-automatic computer jumbo is quite advanced – it only needs one person at the helm while its four mechanical arms drill holes and inserts bolts, all guided by its computer system. The machine drills holes and miners insert explosives, which then blasts away the rock. Trucks transport the muck outside of the tunnel. Shotcrete (sprayed concrete) is applied onto the tunnel walls, and then reinforced with rock bolts. The tunnel walls are finished with more concrete using traveling forms. 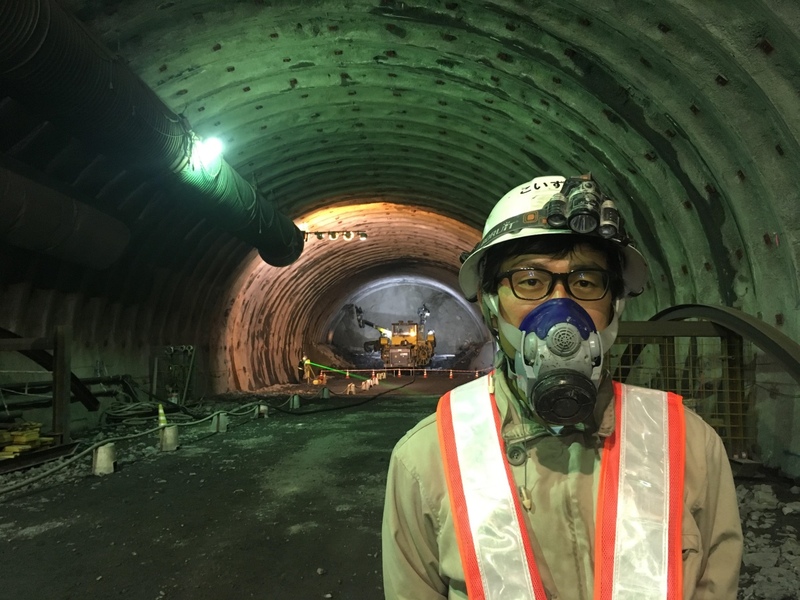 Prof. Masakazu Yoshioka, professor at KEK and visiting professor at Tohoku University and Iwate University, said that the NATM method would likely be used for the ILC tunnel. By then, there may be even safer and more cost-effective methods available. As we continue working to bring about the ILC, at least we know there is plenty of knowledge about creating the tunnel that will be its home.